The Audi R8 has earned its place as one of the most practical super cars in the world, ever since it made its first appearance back in 2006. During the past few years the Audi R8 suffered some changes, and although the exterior of the car has not undergone major modifications, the performances have greatly improved. 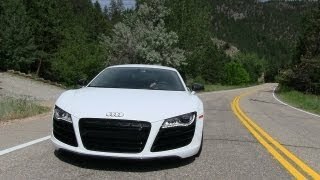 The Audi R8 5.2 FSI Quattro 2012 brings new technologies and greater performances to the table, in the same slick, sporty and practical manner as its predecessors. As the name of the Audi R8 suggests, under the bonnet of the resides a V10 5.2 liter Lamborghini-sourced engine capable of producing 525 horsepower and 391 lb-ft of torque at 6,500 rpm. The raw power is distributed to all four wheels -hence the name "Quattro" in the title- through the six-speed gearbox which can be either a manual or an R-Tronic sequential transmission featuring launch control. The exterior design of the Audi R8 V10 5.2 FSI Quattro 2012 bears a strong resemblance with its predecessors, but manages to distinguish itself from the rest of the pack through bigger side air intakes, oval exhaust outlets, a bit of a facelift, a brand new rear diffuser and a unique LED package. On the inside the Audi R8 V10 2012 has also been improved and enhanced with newer technology, including the highly acclaimed Audi MMI Navigation and the "Bang and Olufsen" 12 speaker 456 watt sound system. A wide range of leather seat coverings are made available to the customer and the seats themselves feature head restraints and the Audi Backguard system. The Audi R8 V10 is one of the few supercars which are able to provide a high level of safety to the driver and passenger, featuring full-size airbags and knee bags. Furthermore, the entire body shell of the Audi R8 V10 5.2 FSI Quattro 2012 has been constructed utilizing ASF technology, the fuel and battery cable are cut off in case of an emergency in order to reduce fire hazards and aluminium impact-absorbing beams protect the driver and passenger from side impacts. So, there's only one question that remains unanswered, and that's the pricing. The manual gearbox version of the Audi R8 V10 5.2 FSI Quattro costs about $149,000 and as far as the R-Tronic variant goes, the price can go up to $158,100. That is mighty cheap compared with the 2011 Porsche 911 Turbo S and the Ferrari 458 Italia which costs roughly $160,000 and $225,000 respectively.